The What: The Nureva Wall WM408i system—winner of an AV Technology Best of Show Award at InfoComm 2018—has begun shipping this month, with general availability in July. 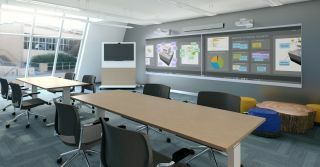 The WM408i combines a high-definition, ultra-short-throw projector with a projected capacitive multitouch surface to create an expansive interactive working space that supports a wide range of collaborative processes and activities. The tightly integrated system delivers an advanced multitouch experience in nearly any space, on almost any wall type, and under almost any lighting condition. The What Else: The new system incorporates an automated startup experience through presence detection. Walls from 7.5 to 60 feet wide can be installed in side-by-side or corner configurations to create workspaces tailored to individual customer needs. It also comes with Nureva Room Manager, which simplifies system setup and adjustments. The Nureva Wall is optimized for use with Span Workspace but can also be used with any Windows application. When the Nureva wall is used with Span Workspace, team spaces with walls full of sticky notes are easily transformed into their digital equivalent without losing the feel of a practical working environment that is focused on process-driven productivity and creativity. Cloud-based Span service brings the added benefit of enabling real-time collaboration among team members from multiple locations and through virtually any device. Remote collaboration is further enhanced by adding the Nureva HDL300 audio conferencing system, which uses Microphone Mist technology to deliver a clear and natural audio experience. The Bottom Line: The WM408i system was developed in response to customer demand for cost effective, large-scale digital workspaces that enable the transformation of existing paper-based collaborative processes such as lean, agile, and design thinking.